(led), Do not confuse this word with the verb led (past tense of lead). A metallic element, atomic no. 82, atomic wt. 207.2. An electrocardiographic cable with connections within the electronics of the machine designated for an electrode placed at a particular point on the body surface. (Pb) (led) a chemical element, at. no. 82. Absorption or ingestion causes poisoning, which affects the brain, nervous and digestive systems, and blood. (lēd) any of the conductors connected to the electrocardiograph, each comprising two or more electrodes that are attached at specific body sites and used to examine electrical activity by monitoring changes in the electrical potential between them. lead I the standard bipolar limb lead attached to the right and left arms. lead II the standard bipolar limb lead attached to the right arm and left leg. lead III the standard bipolar limb lead attached to the left arm and left leg. augmented unipolar limb lead a modified unipolar limb lead; the three standard leads are: aVF (left leg), aVL (left arm), and aVR (right arm). aVF lead an augmented unipolar limb lead in which the positive electrode is on the left leg. aVL lead an augmented unipolar limb lead in which the positive electrode is on the left arm. aVR lead an augmented unipolar limb lead in which the positive electrode is on the right arm. bipolar lead an array involving two electrodes placed at different body sites. limb lead an array in which any registering electrodes are attached to limbs. pacemaker lead , pacing lead the connection between the heart and the power source of an artificial cardiac pacemaker. 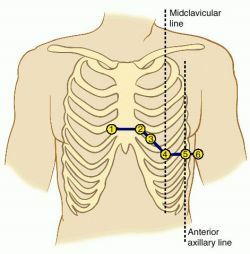 precordial leads leads in which the exploring electrode is placed on the chest and the other is connected to one or more limbs; usually used to denote one of the V leads. standard leads the 12 leads used in a standard electrocardiogram, comprising the standard bipolar limb leads I–III, the augmented unipolar limb leads, and the standard precordial leads. unipolar lead an array of two electrodes, only one of which transmits potential variation. V leads the series of six standard unipolar leads in which the exploring electrode is attached to the chest, designated V1 to V6. XYZ leads leads used in one system of spatial vectorcardiography. an electrical connection attached to the body to record electrical activity, especially of the heart or brain. See also electrocardiograph, electroencephalograph. a common soft blue-gray metallic element. Its atomic number is 82 and its atomic mass is 207.19. In its metallic form, lead is used as a protective shielding against x-rays. Lead is poisonous, a characteristic that has led to a reduction in the use of lead compounds as pigments for paints and inks. Normal concentrations in whole blood are 0 to 5 μg/dL. The normal amount in urine after 24-hour collection is less than 100 μg. Toxicology pronounced Lead, as in dead A heavy metal that paints a broad clinical palette Epidemiology Inorganic lead sources–gasoline, old paints, burning car batteries, 'moonshine' liquor distilled in tubing soldered with lead, foods, beverages Lab RBCs with coarse basophilic stippling, anemia, reticulocytosis, erythroid hyperplasia, autofluorescence of RBCs and erythroid precursors Clinical–chronic poisoning Neuromuscular disease with wrist drop and encephalopathy–convulsions, mania, delirium, paresis, paralysis, abdominal colic, nausea, constipation, weight loss, fatigue, headache, tremor, myalgia, loss of concentration, Fanconi syndrome, aminoaciduria, glycosuria, fructosuria, phosphaturia, protoporphyria-like symptoms, HTN Nontoxic range Serum < 10 µg/dL; urine < 100 µg/24 hr Toxic range > 25 µg/dL Management Chelation–eg, dimercaprol, calcium EDTA, d-penicillamine, succimer. See Lead crystal, Lead line, Lead poisoning, Port Pirie Cohort Study, Saturnine gout, Succimer. pronounced Leed, as in deed Cardiac pacing Catheter, wire The 'deployment' part of a pacemaker, which has 3 components–the wire(s) which carry the electrical signals and pulses to and from the heart, a connector pin and stimulating/sensing electrode(s). See Active fixation lead, Atrial lead, Coaxial lead, Endocardial lead, Inferior lead, Low-threshold lead, Myocardial lead, Permanent lead, Silicone lead, Sprint™ tachyarrhythmia lead, Steroid eluting lead, Temporary lead, Ventricular lead Cardiology Any specific site for placing electrodes on an EKG Standard 12-lead EKG 3 bipolar limb leads–I, II, III, 3 augmented unipolar limb leads–aVR, aVL, aVF, 6 precordial leads–V1-V6 Pharmaceutical industry A candidate unknown substance with properties that suggest to industry experts therapeutic properties. 1. An electrical conductor carrying current or intermittent signals between an organ or tissue and an electrical or electronic device. 2. The tracing obtained from a particular combination of electrode positions. A metallic element, atomic no. 82, atomic wt. 207.2; occurs in nature as an oxide or one of the salts, but chiefly as the sulfide, or galena; 210Pb (half-life equal to 22.6 years) has been used in the treatment of certain eye conditions. 1. A malleable heavy metal with poisonous salts. 2. An electrical connection or electrode by which currents are conveyed to or from the body. Name given the electrode when it is attached to the skin. n a toxic metal that can be found in lead-based paints, leaded solder joints, and some fuel substances. Exposure has been linked to poor functioning of central nervous system as well as learning and behavioral difficulties. n a common soft, blue-gray, metallic element. Its atomic number is 82, and its atomic weight is 207. In its metallic form, it is used as a protective shielding against radiographs. (In dentistry, lead acts as a protective shield against the radiographic beam and is found in the lead apron and walls of the surrounding operatory.) It is poisonous, a characteristic that has led to a reduction in the use of lead compound as pigments for paints and inks. Q. Does lead harm fetuses? A. Lead is highly teratogenic. it affects the fetus Central Nerve System - the CNS. and unfortunately the fetus is very sensitive and absorbs the lead from the mother body. therefor damage to the fetus is higher then to the mother, that means she can be unharmed and the fetus can be affected. because the CNS is built throwout the pregnancy (after the 18th day) it can do damage if exposed at that time. I am not an expert on depression, but I don't think it leads to schizophrenia. Not exercising can certainly lead to other health problems. Everything can go into the death spiral if you just ignore everything and quit taking care of yourself. Q. What are the leading causes of depression and anxiety in women today? Females suffer from anxiety and depression at twice the rate of men. In fact, mental disorders such as anxiety and depression are the leading cause of disability for women. What are the leading causes of anxiety and depression in women? Please provide as credible sources as possible. Thank you. A. I know from experience, hormones. When I was on birth control it made me nuts - anxiety and panic attacks. Mood swings and crying over nothing. Many of my friends have also experienced this on BC - and some who were never on BC started taking it and it balanced them out. So I really believe that hormones play a huge part. Also thyroid problems too. A graduate of Princeton University and SMU's Dedman Law School, Leady, 34, joined the Company's legal department in 1998. They strongly criticized the government for its indifferent attitude with the leady health staffs and resolved that they would not be silent anymore on the injustices being meted out to them. The Supreme Court on Thursday expressed annoyance over nonregularization of services of Leady Health Workers (LHW) and directed the all provincial governments to issue permanent job letters within 24 hours. Ivie near Leady, Texas, will host the second qualifying event March 17. The injured trader was rushed to Leady Reading Hospital (LRH) where he succumbed to his wounds. PESHAWAR -- Class IV employees of Leady Reading Hospital on Wednesday staged a protest demonstration against those elements involved in thieving medicine of the poor patients in the hospital as well as medicine of the hospital. PESHAWAR -- Iqbal zafar Jhagra Governor Khyber Pakhtunkhwa on Monday visited the Leady Reading Hospital (LRH), Peshawar where he enquired about the health of the injured of suicide bomb blast that took place at local court near Shabqadar area of District Charsada. to 12, BS-12 to 14 and BS-14 to 16, 1000 leady health workers (LHWs) and more than 250 community mid-wives (CMWs) were recruited. Likewise the patients diagnosed with other complications such as Retinal detachment were referred to the room No 2 allocated in Leady Reading Hospital (LRH) for the FATA for further management. The seriously injured were shifted to Civil Hospital Shabqadar and Leady Reading Hospital Peshawar for treatment. Talking briefly to media persons here at leady Reading Hospital after inquiring about the health of victims of terrorist attack on Bacha Khan University, he said the purpose of his visit was to express solidarity with the victims on behalf of people of Balochistan and his government. PESHAWAR -- Khyber Pakhtunkhwa Minister for Health Shukat Yousafzai has said that with the establishment of new Intensive Care Unit (ICU) at Leady Reading Hospital, the burden at the most busiest hospital would definitely be reduced.